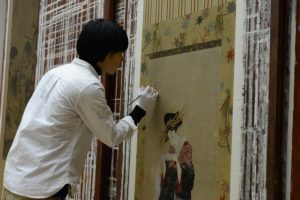 Kyoko Kusunoki joined the Hirayama Studio last year as Conservator of Japanese Paintings. 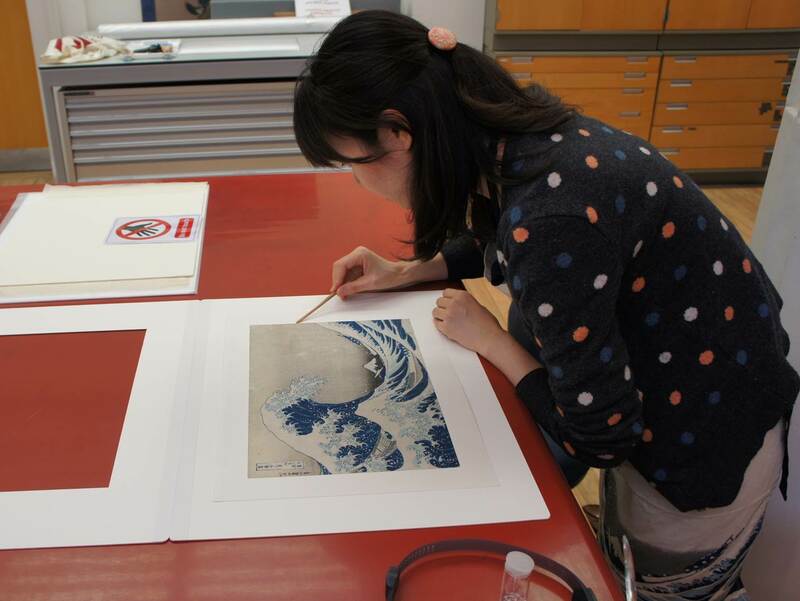 In this blog Kyoko discusses some of the projects she has been working on, including preparing for the exhibition Hokusai: beyond the Great Wave. Working on Katsushika Hokusai (1760–1849), Under the wave off Kanagawa (The Great Wave) from Thirty-six views of Mt Fuji. Colour woodblock, 1831. Acquired with the assistance of the Art Fund. Kyoko Kusunoki handling Japanese mounting silks. Photo: © CXD. In March 2016, I started working at the British Museum as a conservator of Japanese paintings. My workplace is the Hirayama Studio which was established in 1994 with support from Professor Ikuo Hirayama. I am happy to say, I felt at ease from the moment I first walked into the studio, thanks to my lovely colleagues… and the tatami-mats! My main responsibility is overseeing the Sumitomo project to conserve Japanese paintings in the British Museum’s collection. 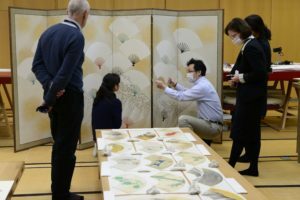 The project is carried out in cooperation with The Association of Conservation for National Treasures (ACNT) of Japan thanks to a grant from the Sumitomo Foundation. In March 2016 I took part in the project planning discussions with ACNT Director Iwataro-Yasuhiro Oka and Tim Clark, Head of the Japanese Collections at the Museum. I then managed all treatment details in the studio. 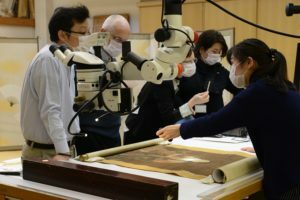 During the project Japanese conservators from ACNT visit the British Museum for short periods of time to advise and carry out scroll mounting treatments together with us at the Hirayama Studio. In 2016, the treatment of the Standing Courtesan Reading a Letter, a hanging scroll by Kitagawa Utamaro (1753–1806), was completed after three years of treatment. 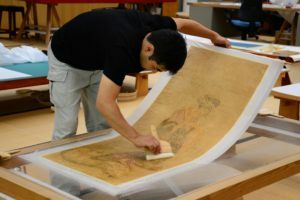 Work also started on the hanging scroll Portrait of young Prince Shotoku Taishi and a pair of six-panel folding screens by Kawamura Bunpo (1779–1821). 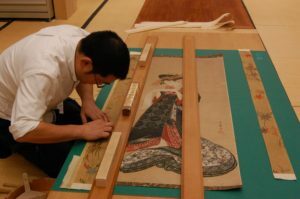 Conservators working on Portrait of young Prince Shotoku Taishi (1961,0408,0.1). Discussion with Iwataro-Yasuhiro Oka (ACNT) and Museum staff. Pair of six-panel folding screens by Kawamura Bunpo (1779–1821) (1999,0302,0.1-2). 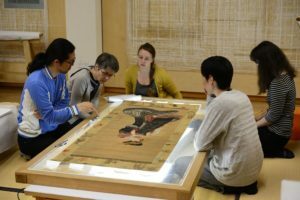 The conservation of the Utamaro hanging scroll was an amazing experience to be involved with. The painting is in black ink and colour on paper. The techniques are highly accomplished and they show the courtesan’s lavish kimono, the scarlet under-robe, which has a pattern of linen leaves in white tie-dye, and the black coat in tasteful green and white shades which has a design of flocking plovers. In response to her lavish dress, a beautiful kimono fabric was used as a mounting fabric (chu-beri) in the 19th century. It shows maple leaves and rice-bag patterns in autumn colours enhanced with delicate embroidery. Some of the leaf patterns had been cut and relocated to make the design fit the mount better. 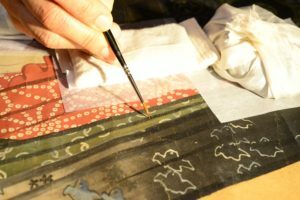 Our treatment of the painting involved many hours of consolidation, cleaning, backing removal, and applying new linings, as well as a very complex and intricate conservation of the kimono silk fabric. 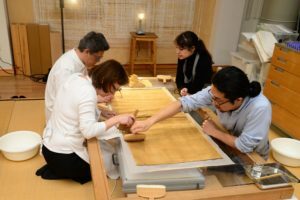 My predecessor, Keisuke Sugiyama, first masterminded the project with Tim Clark and Iwataro-Yasuhiro Oka as well as Monique Pullan and Anna Harrison, the Museum’s textile conservators. The ACNT conservators involved in the treatment were Makoto Kajitani, Masanobu Yamazaki, Atsushi Mikkaichi, Aya One, Aya Matoba and Jun Imada. Apart from Keisuke, the Hirayama Studio conservators were Mee Jung Kim-Marandet, Marie Karadgew and myself. Final lining by Makoto Kajitani and Kyoko Kusunoki. Keisuke Sugiyama, Jun Imada and Museum staff in discussion. Assembling the painting and mounting silk by Atsushi Mikkaichi. Aya finishing the hanging scroll in front of students from Camberwell College, University of the Arts London. 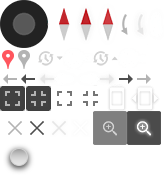 Consolidation of the painting layer by Aya One. First lining by Makoto Kajitani. Surface cleaning, with Keisuke Sugiyama talking to a visitor. Backing paper removal by Masanobu Yamazaki, Keisuke Sugiyama, Marie Kaladgew and Joanna Kosek. 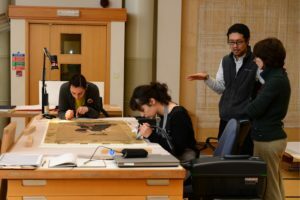 The studio is frequently visited by scholars, students and members of the public, and the Sumitomo Project has offered a great opportunity for me to explain scroll mounting to students and professionals. In addition, the Utamaro painting treatment process has been filmed – watch out for it on the Museum’s social media channels later in 2017. Working on Katsushika Hokusai (1760–1849), Under the wave off Kanagawa (The Great Wave) from Thirty-six views of Mt Fuji. Colour woodblock, c. 1831. Acquired with the assistance of the Art Fund. At the same time, I have also been responsible for the daily needs of the Museum’s collection of Japanese paintings. All Japanese paintings have to be carefully checked and treated when they are to be shown or sent for loan. In the Museum’s Mitsubishi Corporation Japanese Galleries, the rotation of objects usually takes place four times a year. We are also preparing a special exhibition – Hokusai: beyond the Great Wave will be on show in Room 35 from 25 May – 13 August 2017, so I am also busy working on that. In Japan I had worked both in the Tokyo National Institute for Cultural Properties and in the private conservation studio, Bunkazaihozon Co., Ltd. which is part of the ACNT. While working there we would receive objects needing restoration from museums, temples and shrines or collectors and would have to return them after the restoration. When returning objects I always felt sad and glad at the same time. But there will always be endless paintings to be cared for and no end of rewards for a conservator. The Mitsubishi Corporation Japanese Galleries (Rooms 92–94). In September 2016 a student from the Pantheon-Sorbonne University, Matthias Sotiras, joined us for five months. I have been teaching him about Japanese materials and tools, and traditional mounting techniques, by making models of mounts – training students is an important part of my role. Later this year Matthias will be writing a blog on the process of finishing the Utamaro painting carried out with Aya Matoba. 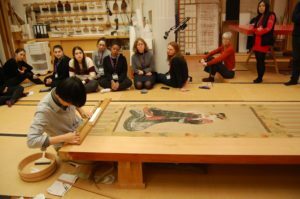 Introducing Japanese restoration tools and materials to students from SOAS, University of London. Hokusai: beyond the Great Wave is at the British Museum from 25 May – 13 August 2017.